We would love to get your stone back to its natural shine! Do your kitchen floors, bathroom floors, entryways, hallways, countertops, showers, tub surrounds or walls need to be restored? Grinding: This method is a very aggressive approach to refinishing stone to remove deep scratches and lippage. The goal of this method is to flatten the floor. Honing: Completed after the grinding phase, this method is a much less aggressive approach than grinding Many projects also may start with honing and skip the grinding phase. This is because it is able to remove minor to moderate scratches and etch marks in a softer manner. Polishing: This is the next step in refinishing your stone coming after the honing phase to bring out a shine in your stone. 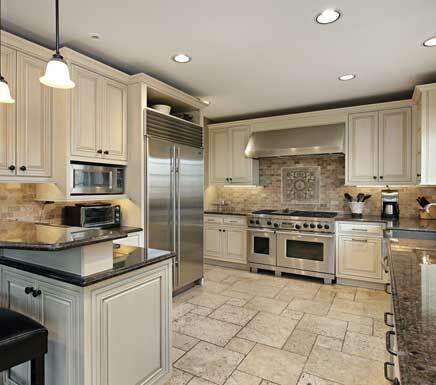 Sealing: The final stage in refinishing your stone is sealing.